I distinctly remember what my husband said when he found me typing an email to a student in the middle of the night, the glow of my laptop illuminating my face in the darkness: “You need to set better boundaries.” Suffering from insomnia–whether it was in the late stages of pregnancy or the first year of night feedings, I can’t remember–I rationalized my behavior by saying that I was being productive since I was up already, and that the student seemed genuinely distraught by the state of their paper in light of a pressing deadline. In fact, his words resonated profoundly with my own sense of being out of balance. Online teaching can blur the boundaries between our work and our lives. People readily remark that online courses take a long time to design and develop, but less time to administer. In other words, they are more front loaded than face-to-face courses. However, communication and interaction with students over email, Skype or Zoom, or even face-to-face can also place considerable demands on our time during the course of the semester. Because we can virtually correspond anytime and anyplace, it is easy to find oneself replying to students during times that one would not even entertain the possibility of a face-to-face meeting. An added pressure is that online students consider prompt responses and feedback from their instructor crucial and an indication that they care. On their evaluations students report greater satisfaction when they receive prompt replies to their emails. Yet we do a disservice when we reply as soon as we see their email, regardless of the time of day. Although this might create a greater sense of satisfaction on the part of our students, it fuels the idea that instructors are constantly “on call” and undermines their own capacity to delay gratification, which is a crucial skill for self-regulated learning. Moreover, when they see that we have emailed in the middle of the night, they may conclude that it’s all right to prioritize other things over sleep, rest, and wellbeing. We lose the opportunity to model to our students a more balanced, mindful approach to our communication and interaction. Mindfulness encourages us to cultivate an embodied presence, receptivity, and awareness of ourselves and our surroundings, so that instead of immediately reacting to what we experience, we can instead create space for a more thoughtful response. We may overlook our bodies as we interface with digital devices and screens, but as Linda Stone has observed through the phenomena of “email apnea” – the temporary absence or suspension of breathing, or shallow breathing, when doing email (https://www.huffpost.com/entry/just-breathe-building-the_b_85651)–our online interactions have physical, emotional, and cognitive ramifications. By immediately replying to students’ emails, I was failing to address my own sleep habits, and I was not giving the space for students to try to resolve their problems by themselves. In the case of students who had clearly procrastinated and emailed me an hour or two before a deadline, one could even argue that I was encouraging bad habits. Aiming for a quick turnaround, I was being reactive rather than responsive. A more mindful approach would have aligned my online communication with the expectations laid out in my syllabus, where I explain that email is my preferred method of contact, and that they should expect a reply within 24 hours. Those parameters allow for balance: one can establish hours to be offline. Admittedly, we may still find the need to accommodate students even when it impinges on our personal lives. Once I found myself emailing back and forth with a student, trying to clarify the expectations of the final project, when he suddenly asked, “Can we talk over the phone?” Although I was at my parents’ house, I felt bad and agreed to call. Bracing myself for the potential of a half-hour interruption, I dialed his phone number. After responding to various questions I hung up and looked at my phone. It had taken less than ten minutes. This made me realize that we should take advantage of multiple channels of communication with our students. In another case, a student asked if we could meet face-to-face to discuss his ePortfolio for the course. We sat together looking at his laptop, and he scrolled through some of the ePortfolio pages to ask about my comments and suggestions. Again, within a very short span of time, I was able to address all of his concerns . . . and meet the student in person. These kinds of interactions with students–over the phone, via Zoom or Skype, or in person–not only show that we care about our students, but they contribute to a greater sense of embodied presence. Although I still have a long way to go, I have found myself trying to be a more mindful online teacher, for the sake of both myself and my students. 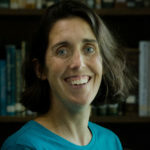 Beverley McGuire is an associate professor of East Asian Religions at the University of North Carolina Wilmington. She received her Ph.D. in East Asian Languages from Harvard University and her M.Div. from Harvard Divinity School. Her research interests include Chinese religious ethics, divination, religious games, and digital media. Her book Living Karma (Columbia University Press, 2014) examined a late imperial Chinese Buddhist monk who sought to change his karma through divination, repentance, and bodily practices such as blood-writing and burning his body. 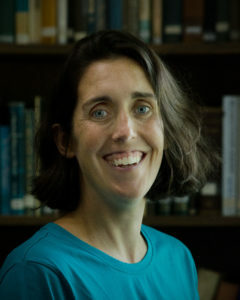 Her current research focuses on the impact of digital technologies on our moral attention - our capacity to discern and attend to morally salient features of a given situation.